Rot… Just hearing the word probably conjures up thoughts of an old tree trunk in the forest, maybe used banana peels, or even carved pumpkins the week after Halloween. 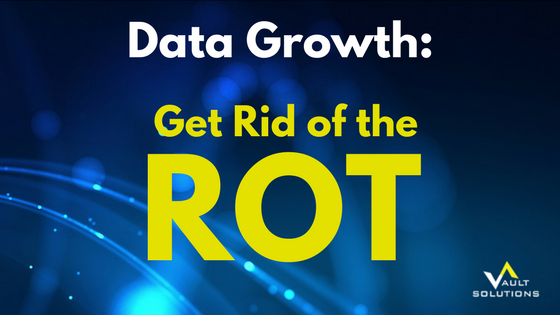 But when we think and talk about rot, we mean Data ROT – Redundant, Obsolete, and Trivial. Not coincidentally, one of the biggest trends the industry is talking about this year is unstructured data growth, and what we can all do about this fast-growing problem. Recently, VeritasTM shared the Databerg report, which talks about the risks of uncontrolled data growth, due mostly to our attitudes and behaviors around data itself. As a society, we tend to believe that more data means more value (fairy tale), that storage of all this data is free (tall story), and that all data is created equally (MYTH!). Unfortunately, these attitudes have led to an ever-increasing data issue – our collective hoarding problem. This impacts not only infrastructure in the form of resource consumption, but also balloons IT budgets and creates security and compliance concerns globally. To get rid of your ROT and begin reducing your data footprint, you need to first know what you’re dealing with in terms of the data you have hiding away. One of the most significant culprits is orphaned data. And the most common formats are content-rich images, videos, and presentations left behind by former employees. Sound familiar? Good. Because identifying and understanding the ROT you have hiding in your archives is the first step towards a leaner, less costly, and more secure environment. The next step?… letting go of that obsolete data for good. To get to expiration, you need to handle a few items BEFORE expiring any data so that important critical data isn’t lost. 1. Ensure that the proper legal holds are in place for any pending or potential litigation. 2. Make sure that the retention is set properly for each user. You don’t want to accidentally delete all of the CEO’s emails while trying to remove old email that belongs to the rank and file. 3. Identify the orphaned data, and process it, potentially with Orphaned Items Processing. For example, archived messages that a user had deleted from their mailbox may appear to have been deleted, when in reality only the shortcut was removed, leaving the item itself in the archive and potentially subject to eDiscovery. 4. If you are storing data on a Centera in Governance Edition (GE) or Compliance Edition Plus (CE+) modes, ensure the retention for items on the Centera match the retention set in Enterprise Vault. Many customers find that the retention is not set properly and may need to be changed. This can’t be done ‘out of the box’, so you will need a product such as our Centera Retention Manager to update the policies set on the data. And then, once you’re ready, you can finally get rid of the ROT.